Currently under construction and anticipated to be LEED Platinum, TwentyTwenty is planned to include 162 residential condominiums, ranging in size from studios to two-bedroom-with-den residences. Located at the corner of NE 21st Avenue and NE Multnomah Street, and perched on the hill just above ‘The Gulch,’ when completed it will bring beautiful new condominium residences to the neighborhood, of which many will feature unimpeded views to the south, as well as views to the north, west, and east. The building will consist of seven stories on NE Multnomah and two levels of below-grade parking. The timeless yet contemporary design of the building was inspired by the geological forces which resulted in the formation of the gulch, and the exterior materials were selected for their compatibility with the surrounding architecture in the neighborhood. Connecting with the Irvington, Grant Park, Hollywood, Laurelhurst, Kerns, and Lloyd neighborhood districts, the Sullivan’s Gulch neighborhood is uniquely situated and is composed of a wide mix of housing types and businesses, including cozy cottages and bungalows, grand historic foursquare homes, mid-century architecture, multi-story residential buildings, restaurants, cafes, pubs, shops, essential services, and a hotel. TwentyTwenty is located within easy distance of local amenities, with a “Very Walkable” walk score of 86 and a “Biker’s Paradise” bike score of 98. To the west is the Lloyd Center regional shopping mall which is undergoing a multi-million dollar renovation, the tree-lined Holladay Park, and the Lloyd employment district. The Lloyd Center light rail station is a half mile away. Just under two miles away are the Broadway Bridge and Steel Bridge crossings at the Willamette River. Five blocks north of the development sits NE Broadway Street with its neighborhood shops, cafés and pubs, and on the other side of Broadway is the venerable and picturesque Irvington neighborhood. Toward the east, shoppers can find the Hollywood Fred Meyer store and a New Seasons grocery. And to the south are East Burnside Street and NE Sandy Boulevard, with burgeoning development and an exciting restaurant scene. Both NE 21st Avenue and NE Multnomah Street include designated bicycle lanes to facilitate bike transportation in the vicinity and connecting to the City’s network of bicycle lanes and paths, which extend to downtown Portland and beyond. This location also has been designed as a connection point for the potential future Sullivan’s Gulch Trail. This trail head is anticipated to be located directly outside the building’s private bicycle entrance. Building amenities have been designed to provide a comfortable yet high-end living experience for residents. A lobby lounge with seating will allow residents to meet and gather around the fireplace. TwentyTwenty will also feature a fitness room, a pet wash room, and a bike lounge which will include a bike lobby, bike wash, repair & maintenance area, and other features. Outside, a landscaped deck will provide outdoor seating and niches with barbecues. 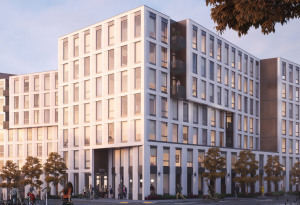 Controlled building access, the availability of underground parking and electric vehicle parking spaces, package delivery lockers, and Concierge service contribute to the living experience.